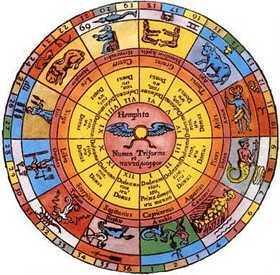 Your birth chart, or horoscope, is usually shown in the form of a wheel, symbolising the cycles periodically undergone by all living things on this planet. The symbols ("glyphs") displayed stand for the astrological signs, planets and other chart factors representing forces which may affect your life at any given time. Each of these astrological factors represents a coded set of drives in your sub-conscious. Drives may be activated and brought to your awareness by circumstances in your life, presenting you with a range of choices. Of course, your choices are to a considerable extent limited and determined by your character, which is itself revealed through an understanding of the symbols that make up the chart. Your birth-sign is the sign in which the Sun was placed on your birthday. Astrologers call it your Sun Sign. This marks your deep character, the stamp of your most fundamental energies and potential for spiritual growth. However, there are other very important signs, including your Ascendant or rising sign, Moon sign, Ruling Planet, and the signs of the other planets and sensitive points in the chart, such as the Part of Fortune and the Moon's nodes. Since you have found this page, you probably have your own personal birth chart (horoscope) already calculated, but if you do not, please click here to calculate your own chart. It's free! To find your birth-sign, familiarize yourself with the symbols, or glyphs of the planets and signs. Next, find the symbol, or glyph, on the chart which represents the Sun. It is a circle with a dot in its centre. The number in bold type alongside the Sun glyph is the degree of the sign in which it is located. The glyph next to the bold number is the birth sign, the sign of the Sun, the light of the individuality. The number in plain type next to the sign glyph is the minute of the degree of the Sun sign. So the Sun may be located, say, at 12 degrees 50 minutes of Aries, or whatever, making that your birth sign. Click for a detailed analysis of each Sun Sign. The Sun sign is the most significant, but the sign of the Moon and the sign on the Ascendant are next in importance, for the Moon stands for the emotional personality and habitual modes of behaviour and the Ascendant stands for the self-image, including your bodily appearance. Understanding the meaning of the Moon sign and Ascendant are essential in gaining a more rounded perspective on your character. Check out Sun, Moon, Ascendant to really learn the difference. The positions of the planets in the signs and houses and their relationships (aspects) determine your character; knowledge of the symbolism is the key.